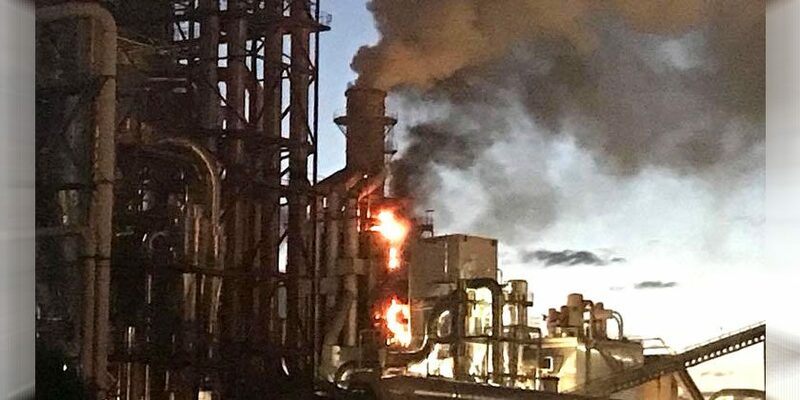 Wrexham Council are ‘liaising closely’ with Kronospan after the recent large fire at the Chirk factory. After the incident we asked Wrexham Council if they would be investigating as a result of the fire amid claims by one Executive Board member and local Councillor there was ‘massive pollution’ that evening. Cllr Hugh Jones, Lead Member for Communities, Partnerships, Public Protection and Community Safety, said: “Kronospan have notified the Council’s Public Protection section that a fire occurred at 9.50pm on Tuesday, July 31, in part of the abatement plant associated with the particle board process. The cause is currently under investigation. Several fire tenders attended and doused down for several hours. “Kronospan are liaising closely with Public Protection Officers during the course of the investigation and in relation to any outcome actions required. The process is regulated by an environmental permit issued by the Council. Today Wrexham Council told us: “Following excess dust emission incidents from the Kronospan site in September 2017, additional dust management measures were implemented by the company. Top pic: The Kronospan fire on Tuesday evening.